Editor's Note: This is Kitco's tool to help traders and investors determine tomorrow's price trends in gold and silver today! Gold and silver's predicted short-term price trend is determined through Intermarket analysis. Proprietary calculations are used to analyze several different markets that are influencing gold and silver prices, and determine the predicted price trend. With Kitco's help you can be ahead of the game by having a good idea whether the next trading day's price trends will be up or down--and knowing before everyone else does. 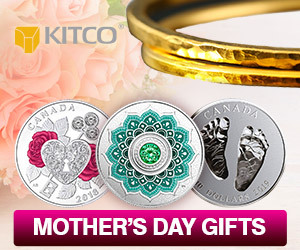 Visit Kitco daily to obtain the latest predicted price trends in gold and silver! This is www.vantagepointsoftware.com's latest Intermarket analysis, including the Predicted Short Term Crossover and Predicted Neural Network studies, suggest the following intra-day price trends for spot (cash) gold and silver futures for the next trading day. Spot Gold Intra-Day Trend: Lower. VantagePoint’s short-term indicator is still bearish. Spot Silver Intra-Day Trend: Lower. VantagePoint’s short-term indicator is still bearish. The Predicted Short Term Crossover study provides directional market forecasting by predicting one day in advance when VantagePoint’s proprietary predicted two-day exponential moving will cross above or below a five-day simple moving average. The Predicted Neural Index is a highly accurate forecasting tool that predicts whether a market will move higher or lower in the coming two days. The Predictive Neural Index compares two three-day simple moving averages to one another – today’s actual three-day simple moving average with a predicted three-day simple moving average.